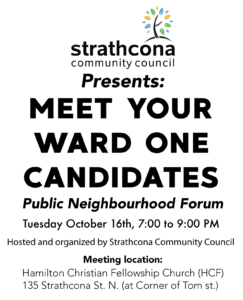 The Strathcona Community Council is hosting a Ward 1 Candidates Forum on Tuesday, October 16th from 7 to 9 pm at The Hamilton Christian Fellowship church (HCF), 135 Strathcona St. N. (at Corner of Tom st.). “This is a chance meet all the candidates and learn more about their individual platforms,” says SCC President Dominic Sorbara. All are invited.